Sometimes you get a moment when you’re traveling when you think–this is it. This is why I got on a plane, a bus, a boat and went somewhere unfamiliar. This is why you travel. You’re a stranger in a new place, but that place feels familiar. 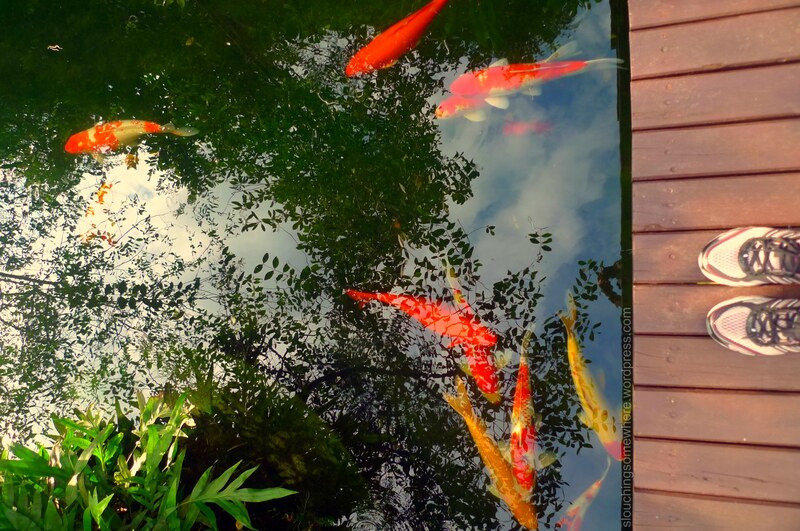 Everything is new to you, but it also feels like a page from your childhood. You get a connection from the place. It’s almost like magic. When my sister and I went on our Bangkok trip last June, we both knew we wanted to see a muay Thai match. It wasn’t because we were big fans of kick boxing. We liked boxing in general. We grew up watching my dad watch boxing. Sugar Ray Leonard, Evander Holyfield, Mike Tyson, Oscar De La Hoya type of boxing . They were the names we got to know on Sundays whenever there was a big boxing match in Las Vegas. You couldn’t talk to my dad during those Sundays. He would be parked in front of the television, his eyes never leaving the screen. He watched intently, though never quietly. He would shout, groan, whoop, and curse at the TV. All the while, my siblings and I would sit beside him, watching the match and watching him. Enamored of both. When we booked our tickets to Thailand, I knew I wanted to watch a muay Thai match. 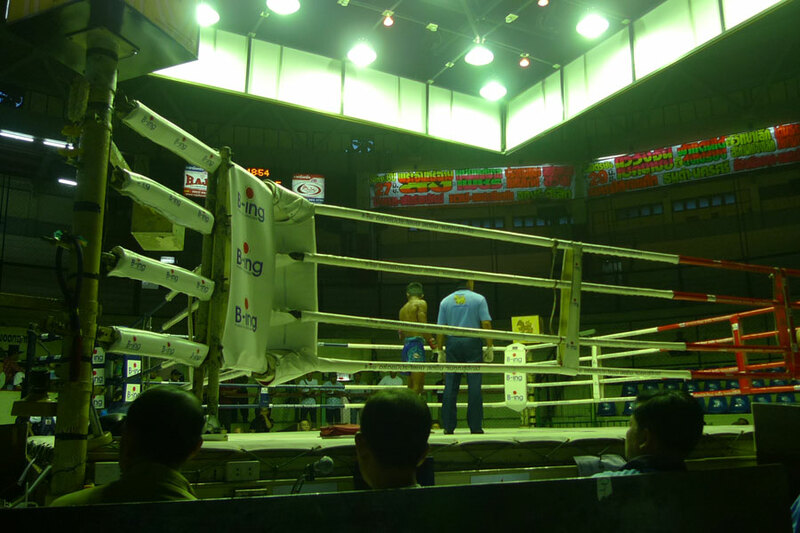 Seeing a kick boxing match live was going to be be a different way of experiencing a part of Thailand’s culture and it was my chance to watching a boxing match ringside. Kick boxing but still boxing, I thought. 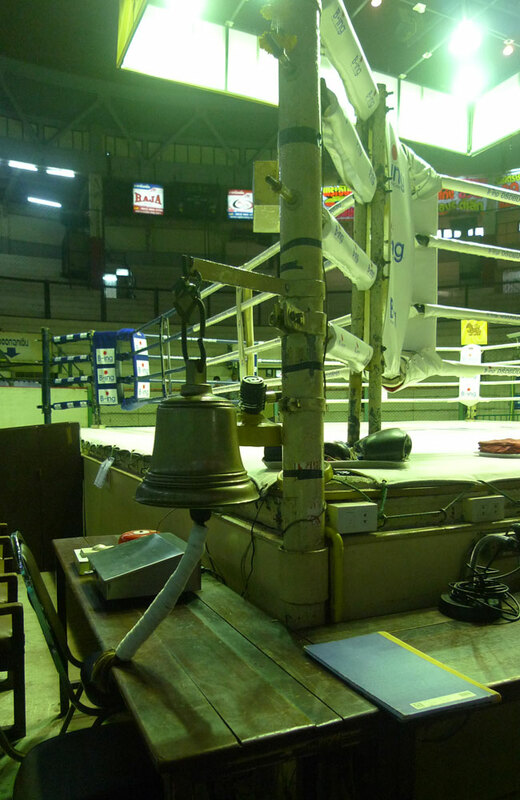 Of course, we didn’t know ringside seats for tourists would cost 2,000 Baht (65USD), an amount, which after spending a couple of days in the budget paradise of Bangkok, was relatively pricey. 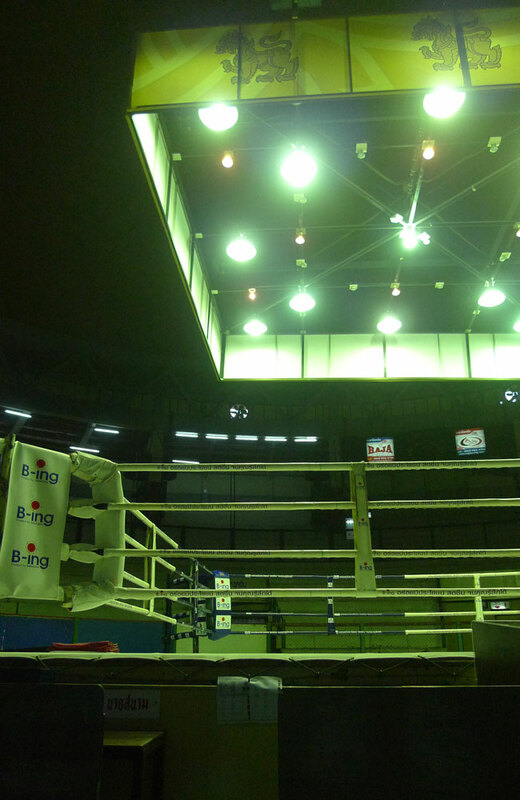 But all thoughts of “I can spend that in shopping” vanished the minute one of the ticket ladies of Ratchadamnoen Stadium opened the door and led us down to boxing ring “just to take a look.” My sister was right. We were goners the minute we saw it. That ring, harshly lit and all, that stadium, which has obviously seen better days, was one of the most beautiful sights I had ever seen. My sister said it best when she wrote that it felt “both church and home.” I felt like I was back in the living room of our old place in Manila, beside my dad, just watching. We got settled behind the judges. Most of the audience (not surprisingly) were men, locals and groups of Americans, Japanese, Australians, etc. My sister and I pretty much kept to ourselves, watching intently, every strike and kick, being our father’s daughters. 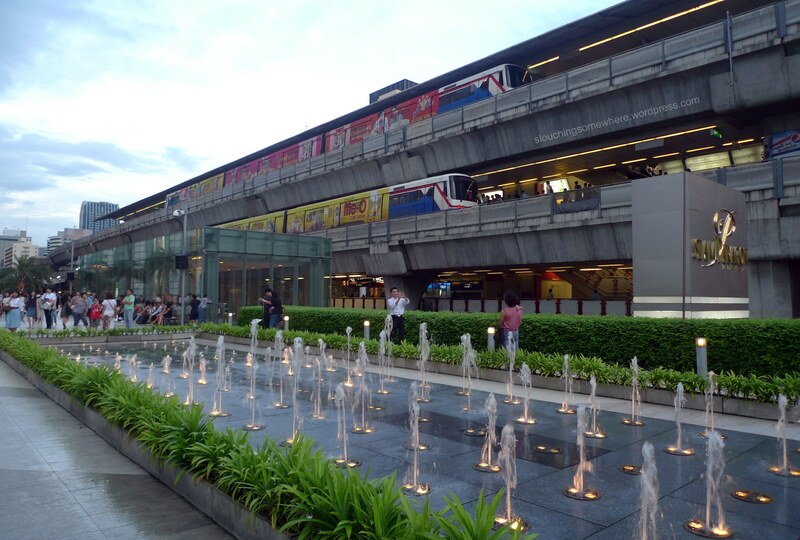 With a few more travel notes to share on my trip to Bangkok with my sister, here’s another entry on what became our favorite stop of the BTS Skytrain: Siam. Siam Station is where the two lines of BTS (Sukhumvit and Silom) intersect. One side is lined with some spanking malls, from shiny Siam Paragon to Siam Discovery, while the other is a maze of small boutiques, cafes, restaurants, multiplexes, tiny alleys of shops, and tinier galleries that is Siam Square. Throughout our vacation in the Thailand capital, my sister and I found ourselves returning to the station and to the square, where there were always shops, restaurants and corners to explore. We were introduced to the place on our first night in Bangkok. Coming straight from the airport, we headed to Siam Square to meet two friends for dinner before their flight back to Manila. Over our first Thai meal of Pad Thai noodles, Tom Yam soup, and other local dishes, our friends who regularly go to Bangkok, shared their favorite places to wander around in the city and Siam Square was one of them. 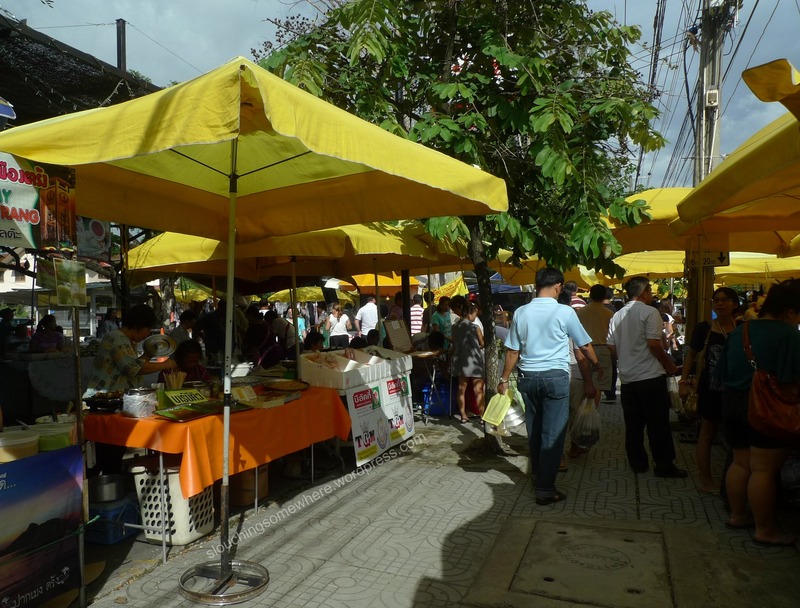 During weekend mornings, many folks in Metro Manila (at least those who wake up before lunch time) like to troop to the weekend markets around the city. The more popular are Salcedo and Legaspi markets in the CBD of Makati, Mercato Centrale in Bonifacio Global City, and Sidcor Market in Centris along EDSA corner Quezon Ave. in Quezon City (which is where I usually go to after early morning runs, since it’s a few minutes away from the house). The one Saturday morning we spent in Bangkok, my cousin took me and my sister to the weekend market of her neighborhood to buy our breakfast. Bangkok is certainly well-versed when it comes to shopping and weekend markets. You only have to find yourself in the middle of the sprawling Chatuchak Market, three hours into your shopping and having covered only a row or two of shops to know that Bangkok is serious about shopping. And attracting shoppers. Suan Luang weekend market though, located in a quiet residential area, is not massive nor touristy (shoppers are mostly residents), but the finds are fantastic for anyone in the mood for local Thai food. When we got there, apparently the area near the Suan Luang park, where the weekend market usually sets up, was undergoing some sort of construction or renovation, so the stalls were spread out on the sidewalks and the parking spaces. 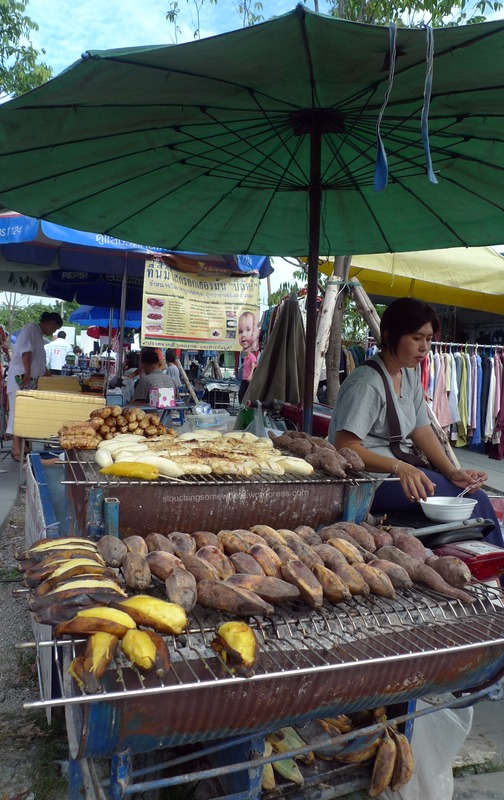 Good thing my cousin still found her favorite stalls: the one that sells grilled bananas (love this! ), another that sells satay or grilled chicken, one that sells steamed brown and white sticky rice (which had quite a queue), and the milk tea stall of a husband and wife who spent the rest of the week working in a law firm. Anyone who’s traveled knows that leaving home and going off somewhere can alter one’s long-held perceptions of a place, of a culture, of people or even of yourself. It can be life-changing or it can be the simple, everyday stuff. This entry is on the everyday stuff. Something as simple as perceiving yourself as someone who doesn’t shy away from spicy food, for example. You were raised by a mom from Bicol (the region in the Philippines that loves its chili pepper the most) who regularly cooks laing and Bicol Express (dishes with lots of chilies and coconut milk) and nannies who liked to snack on siling labuyo or bird’s eye chili on its own. (Not just to flavor a dish or have it on the side. But eat it on its own like peanuts.) One of the reasons you were actually looking forward to your trip to Thailand is because they eat lots of spicy food over there. Your kind of people! 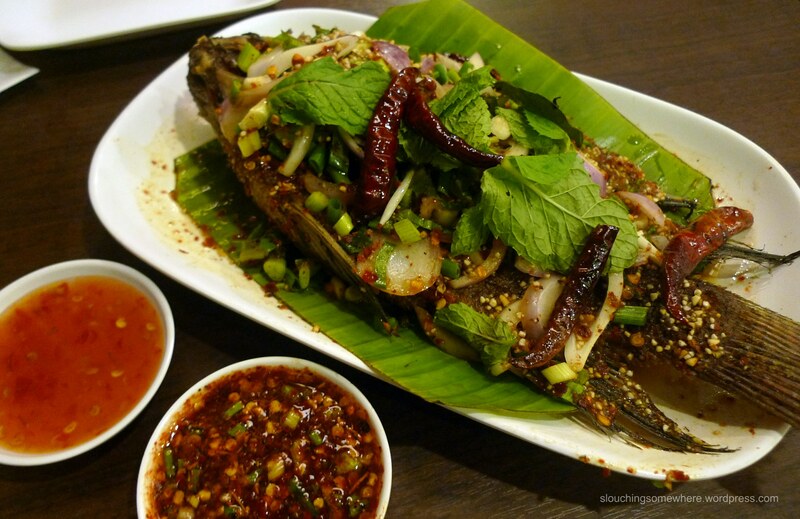 Your first few meals subtly introduce you to Thai food with only a few dishes giving a pleasant heat to the meal. Then you and your sister decide to eat at Som Tam Nua, a restaurant in Siam Square with a permanent queue it seems and popular for its papaya salad (som tam) dish. CNN Go and friends recommend it so you eat there and order som tam, a fried fish, and what you thought was Pad Thai (it wasn’t).